You can do a huge amount to improve your mental health using diet and nutrient therapy. Indeed, correcting your diet and supplementing can help balance your neurotransmitters, brain chemistry, and hormones, and improve your moods, anxiety levels, sleep, attention, memory, etc. The single most important thing you can do to keep your brain functioning at its peak and prevent brain ageing […] you must be vigilant about what you put on your plate. It’s as simple as that. Nutrition is the most important tool for staying mentally and physically fit. Perlmutter, D. and Colman, C. (2004). The Better Brain Book. New York: Riverhead Books, p. 61. Stahl, S. T., Albert, S. M., Dew, M. A., Lockovich, M. H., &amp; Reynolds, C. F. (2014). Coaching in Healthy Dietary Practices in At-Risk Older Adults: A Case of Indicated Depression Prevention. The American Journal of Psychiatry, 171(5), 499–505. https://ajp.psychiatryonline.org/doi/abs/10.1176/appi.ajp.2013.13101373. Eating a balanced and varied diet is crucial for good mental health. Sarris, J., Logan, A. C., Akbaraly, T. N., Amminger, G. P., Balanzá-Martínez, V., Freeman, M. P., Hibbeln, J., Matsuoka, Y., Mischoulon, D., Mizoue, T., Nanri, A., Nishi, D., Ramsey, D., Rucklidge, J., Sanchez-Villegas, A., Scholey, A., Su, K. and Jacka, F. (2015). Nutritional medicine as mainstream in psychiatry. [online] The Lancet Psychiatry, 2 (3) pp. 271–274. Available at: https://www.ncbi.nlm.nih.gov/pubmed/26359904 [accessed 18 Aug. 2017]. The nutrients from the food you eat and absorb are the building blocks for making and maintaining healthy brain cells, neurotransmitters, and hormones, which are all essential for good mental health. Holt, S. and MacDonald, I. (2011). Depression: Natural Remedies That Really Work. Auckland [N.Z. ]: Wairau Press, p. 155. Nutrient therapy can be used on its own, or in parallel with psychiatric medication, and research demonstrates that the efficacy of psychiatric medication is greatly improved when nutritional imbalances are corrected. Walsh, W. (2014). Nutrient Power. New York, NY: Skyhorse Pub., Chapter 1. Davison, K. and Kaplan, B. (2012). Nutrient intakes are correlated with overall psychiatric functioning in adults with mood disorders. [online] The Canadian Journal of Psychiatry, 57(2), pp. 85–92. Available at: https://www.ncbi.nlm.nih.gov/pubmed/22340148 [accessed 18 Aug. 2017]. See below for guidelines on how to correct your nutrition and supplement for better mental health. Eat at least three complete meals a day (containing the three main macronutrient groups – complex carbohydrates, proteins and fats) and do not skip meals. Read more about how to correct each of the three main macronutrient groups by clicking on the links below. Stress is implicated in IBS and peptic ulcer disease Vanuytsel, T., van Wanrooy, S., Vanheel, H., Vanormelingen, C., Verschueren, S., Houben, E., Salim Rasoel, S., Tóth, J., Holvoet, L., Farré, R., Van Oudenhove, L., Boeckxstaens, G., Verbeke, K. and Tack, J. (2014). Psychological stress and corticotropin-releasing hormone increase intestinal permeability in humans by a mast cell-dependent mechanism. [online] Gut, 63(8), pp. 1293–1299. Available at: https://www.ncbi.nlm.nih.gov/pubmed/24153250 [accessed 18 Aug. 2017]. Chew your food carefully and attentively, some say at least 30 times for each mouthful Mercola. (2015). Should You Really Chew Your Food 32 Times? [online] Mercola. Available at: http://articles.mercola.com/sites/articles/archive/2015/12/12/chewing-food-thoroughly.aspx [accessed 15 Nov. 2017]. Avoid processed foods, and foods containing refined carbohydrates such as sugars and white flours. Eat whole foods, especially vegetables and fruit which are extremely rich in key vitamins, minerals, antioxidant and anti-inflammatory phytochemicals. It has been shown that micronutrients are capable of influencing genetic expression, with the result that depending on which micro and macro nutrients you absorb, genes for health or disease can be switched on or off Verheesen, R. and Schweitzer, C. (2009). Micronutrients and amino acids, main regulators of physiological processes. [online] Medical Hypotheses, 73 (4), pp. 498-502. Available at: https://www.ncbi.nlm.nih.gov/pubmed/19608349 [accessed 18 Aug. 2017]. These micro-nutrients are essential for optimal function of our organs, and a correct balance is crucial for our mental health Burdon, R. and Kiroski, I. (2013). Current progress and impact of broad-spectrum micronutrients and the future of mental health research: insight from Dr. Bonnie Kaplan. [online] Journal of Undergraduate Research in Alberta, 3 pp. 1–3. Available at: https://journalhosting.ucalgary.ca/index.php/jura/article/viewFile/30134/24657 [accessed 18 Aug 2017]. 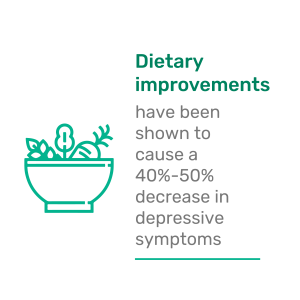 Diets high in vegetables, fruit and wild fish are associated with a lower risk of depressive symptoms. Minocha, A. (2014). Is It Leaky Gut Or Leaky Gut Syndrome? Shreveport, LA: Logos Enterprises LLC., Perlmutter, D. and Colman, C. (2004). The Better Brain Book. New York: Riverhead Books, p. 62. “Traditional diets” which are rich in whole foods, fruit, vegetables and fish, for instance Japanese and Mediterranean diets, have been found to lower the risk of depression and anxiety by 25-30%. Jacka, F., Pasco, J., Mykletun, A., Williams, L., Hodge, A., O’Reilly, S., Nicholson, G., Kotowicz, M. and Berk, M. (2010). Association of Western and Traditional Diets With Depression and Anxiety in Women. [online] American Journal of Psychiatry, 167 (3), pp. 305–311. Available at: https://www.ncbi.nlm.nih.gov/pubmed/20048020 [accessed 18 Aug. 2017]. Sánchez-Villegas, A., Delgado-Rodríguez, M., Alonso, A., Schlatter, J., Lahortiga, F., Serra Majem, L. and Martínez-Gonzalez, M. (2009). Association of the Mediterranean dietary pattern with the incidence of depression: the Seguimiento Universidad de Navarra/University of Navarra follow-up (SUN) cohort. [online] Archives of General Psychiatry, 66 (10), pp. 1090–1098. Available at: https://www.ncbi.nlm.nih.gov/pubmed/19805699 [accessed 18 Aug. 2017]. Higher consumption of vegetables may cut the odds of developing depression by as much as 62%: Greger, M. and Stone, G. (2016). How Not To Die. London: Macmillan, p. 203. Plant foods such as vegetables, fruits, herbs, teas, etc. are a great source of polyphenols which are anti-inflammatory and antioxidant, and as such have antidepressant qualities Greger, M. and Stone, G. (2016). How Not To Die. London: Macmillan, p. 57. To become more aware of your eating habits and how you could improve them for better mental health, try keeping a food and mood diary for two weeks, noting down what you eat, when you ate it, and how it made you feel, both physically and emotionally: Talbott, S. (2007). The Cortisol Connection. Alameda, CA: Hunter House, p. 228. Notice emotional symptoms – do some foods make you feel happy, lethargic, spaced out, anxious, relaxed or even depressed? Notice physical symptoms – do some foods give you bloating, gas, a fast beating heart, dizziness or indigestion? Have a blood test with an integrative practitioner to check your nutritional levels (vitamins, minerals, EFAs, etc.) once a year if possible to identify any deficiencies. Identify problem foods and beverages, by noticing any negative effects on your mental or physical health when you consume them, and/or with a food intolerance test. Once you have identified them, make sure to cut them out of your diet. Problem foods and beverages to avoid. As a result we may not be absorbing the right quantity or quality of minerals, vitamins, EFAs and amino acids in order to build the right hormones and neurotransmitters for mental health. Therefore we may need to supplement. However if you cannot work with a nutritionist or health practitioner, cultivate food awareness and become familiar with healthy eating guidelines and your nutritional needs. Supplementation can be helpful in making sure that you are getting the right nutrients for your mental health. It is best to supplement according to your specific nutritional deficiencies, which can be identified with various diagnostic tests (blood, urine, etc.). There are thousands of supplements on the market. Ideally, you would work with a trained dietician, nutritionist, doctor or healthcare practitioneer to select the best products for your unique biochemical needs. Always read the label. Follow the recommended dose unless you have been advised otherwise by a professional healthcare practitioner. Probiotics — as broad spectrum as possible. Read more about using supplements by clicking on the links below. Supplementing with herbs and spices can be very helpful for addressing mental health symptoms, and in conjunction with correcting your nutrition and taking dietary supplements, can really boost your healing. Herbs and spices can often be a second line of defence, when dietary supplements alone are not enough. Ideally work with a herbalist to develop a herbal supplement programme. How to heal with herbs and spices. You can have an excellent diet, however as we have seen in gut issues, if your gut is leaky, or you have gut dysbiosis, or digestion issues, you will not absorb the correct macro and micro nutrients from your diet that you need to make the right hormones and neurotransmitters for optimal mental health. Healing your gut can be one of the most important steps you can take in order to correct your nutrition and supplement. Read more about how to heal your gut by clicking on the links below. As we have seen in nutritional imbalances, lifestyle and psycho-spiritual factors such as stress and poor state of mind can also lead to nutritional imbalances. Below are some solutions to these contributors which, in turn, can help you correct your nutrition. Correct breathing can help calm our nervous system, and is important for proper digestion and absorption of nutrients. Having a calm nervous system, especially around mealtimes, is essential to digesting and absorbing nutrients from our food. We can enhance our state of relaxation by practicing relaxation techniques regularly. A regular meditation practice can help to balance our nervous system, thereby improving our digestion and absorption of nutrients. Regular exercise helps to boost our metabolism, improve our blood and lymph circulation, and calm our nervous system. All these effect are helpful in improving our digestion and absorption of nutrients. Mind body therapies such as yoga, qi gong, massage, acupuncture, etc. can help balance hormones, boost metabolism, calm the nervous system, improve blood and lymph circulation, all of which are helpful for digestion and absorption of nutrients. How to practise mind body therapies. Connecting with nature and natural light can calm the nervous system. A gentle walk in the country after a meal can help with digestion and absorption of nutrients. Getting enough sleep (7 to 8 hours a night) is important for digestion and absorption. A lack of sleep can cause inflammation and an increase in stress hormones, which over time can hamper our ability to digest and absorb nutrients. In order to optimise nutrients absorption it is important to get enough sleep every night to. Using technology and social media around or during mealtimes can increase our stress levels and prevent us from being in the present moment. For optimal digestion and absorption, it is important not to multi task, to be relaxed, and focussed on the present moment. Therefore managing technology and social media use can help with optimal digestion and absorption of nutrients. Mental therapy can help to calm the nervous system, by helping us get a perspective on our problems. It can help to feel more in control of our lives and heal past trauma. A more balanced nervous system is important for optimal digestions and absorption of nutrients.